Pottery Cottage needed sensitive renovation because of structural damage and years of neglect. A grade II listed building, the renovation was focused on preserving the original features of the cottage (Edwardian panelling; spiral staircase and Yorkshire lights) whilst incorporating the modern facilities and level of comfort to be expected in a well appointed holiday cottage. The renovation was completed in May 2008. 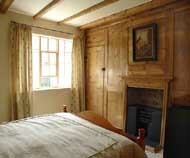 The cottage has two double bedrooms. All bed linen and towels are provided. 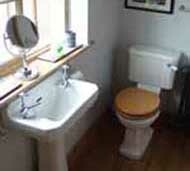 Pottery Cottage enjoys a South facing aspect and garden furniture is provided in the communal garden area. Because of the shared nature of the garden area we are not able to allow pets. There is also a no smoking policy in the house. The lounge and kitchen area has a solid oak floor, exposed stripped beams, Edwardian panelling and hand made tiles. There is a fully equipped kitchen area with oak units and built in appliances including a washing machine. It is equipped to cater for six people. The polished spiral staircases are quite steep but have been made safe by a carpet runner, wrought iron banisters, hand grips and balustrades.